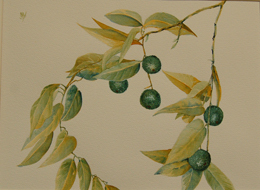 Painted loosely, rapidly and usually on site, Barbara Yaeger’s watercolors are not botanicals in a traditional sense. They capture the essence of the natural object without the detail of a traditional botanical painting. The artist is adept at painting spring wildflowers in flowing color as well as painting the subtle hues of dried or dormant winter plants.